The Eleni is a hall table with character. 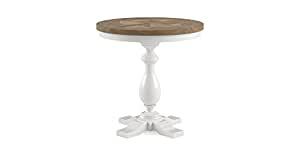 French provincial design with an industrial edge, the piece adds character and convenience to any living space. Seen here with the Camden Armchair in Leather. All premium solid wood products feature their own unique appearance. Colours and markings may vary due to the natural quality of each piece of wood.